Hey, hey, hey! I finally have time to sit down and type out this post. Every time I tried to get to work, something came up. This week has been a bit of a rollercoaster. Without further adieu, here's the return of the Zoya PixieDusts! If you aren't familiar if them, they're a textured polish. I didn't top coat them for my review, but you can do so if you want them smooth and glossy. Just know you might need two coats of top coat to smooth it over. 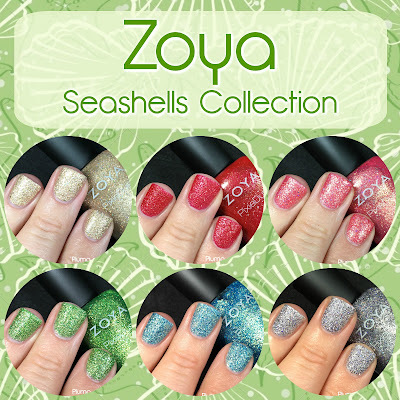 The Seashells collection is available now! The entire Seashells collection can be purchased for $60 or single bottles for $10 at www.zoya.com or at retailers like Ulta.